We got an unexpected visit from Sebastian, one of Romy’s army friends that he was deployed with when they were both in the 1244th. Sebastian just got back from a second deployment to Afganistan and had a few weeks before he had to go back to work, so he drove out in his STI to Vegas and LA with one of his friends, and then when the friend had to leave, he drove up the coast to San Francisco to come visit us. We got a phone call while Nicole was still here helping sew the yurt, and it was Sebastian asking if it would be alright to come and visit for the weekend. He got here Thursday night, and we came up with a crazy plan for the weekend. Sebastian heard of a ranch in Washington state where there were supposedly a high frequency of UFO sightings. The guy who owned the ranch invites people to come and camp on his land and watch the skies for UFOs and other weird lights. The owner claimed that there was a lot of activity in the skies over his ranch on a nightly basis. Sebastian, being into aliens and stuff, was going to go drive up there for the weekend, and asked us if we were free and if we wanted to come with. Not being able to resist such a crazy road trip, we said wtf why not? And so it was in the plans to leave at 4am Saturday morning and drive north along the Cascade Mountains into southern Washington. At 4am, we promptly jumped into Sebastian’s Subaru STI and hit the road. I was still really tired, so I fell asleep in the backseat, and didn’t wake up until we were almost at Mt Shasta. We got coffee in Mt Shasta City and kept going north along the Cascade Range heading towards Klamath Falls. We saw all kinds of volcanic things, mainly lava cones and rounded volcanic peaks. As we crossed into Oregon, we decided to make a quick detour to Crater Lake National Park. Romy and I were there once before in the summer time, but we were afraid it might be closed in the winter. We drove along the road into the park, and the snow kept getting higher and higher on the side of the road, although the road itself was completely clear. We got to the Rim Village, the only thing open in the park, and parked the car. We couldn’t actually see the lake because the snow drifts were so high around the rim until we climbed up the snow bank. We got a blast of freezing cold wind as we topped out over the snow bank to get an incredible view of the crater lake. The wind was so cold, it chilled us to the bone within 10 seconds, so after getting a short glimpse, we ran back into the car and started making our way back. The only other people there were cross country skiers. The rim road was closed, so the village was the only thing you could drive to. The rim road is only open 3 months out of the year in summer when all of the snow melts. The lake doesn’t freeze over in winter. I created this panoramic picture out of four photos at Crater Lake. 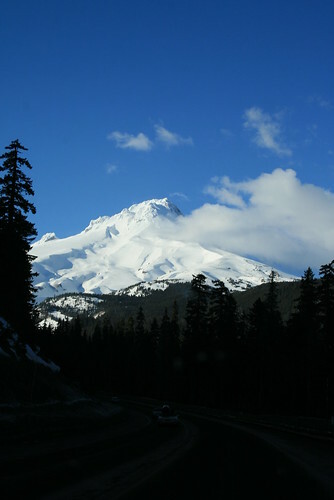 We drove further north, on the east side of the Cascade Range, and started seeing all kinds of volcanic peaks. It was amazing to see the dark green cascades with large white snow covered cones sticking up. We saw The Three Sisters, a triplet of 10,000ft + peaks, and then we saw Mt Jefferson and topping it off in Oregon, we saw Mt Hood. We could see Mt Hood from really far away, and it was so clear and cloud free that day that we saw the entire mountain. The road took us right to its base, and one spot in the road allowed a clear view to the top – it was huge and looked so frozen! Mt Hood from the road. After being awed by Mt Hood, we reached the Columbia River which separates Oregon and Washington. We crossed it on a small toll bridge. The river creates a gorge which looked awesome in the setting sunlight. We were now less than ½ hour away from the UFO ranch. Off in the distance we could see Mt Adams, getting bigger and bigger as we approached it. It seemed is if the GPS was pointing us straight into Mt Adams, and it was – the ranch ended up being near the base of the large volcanic peak! 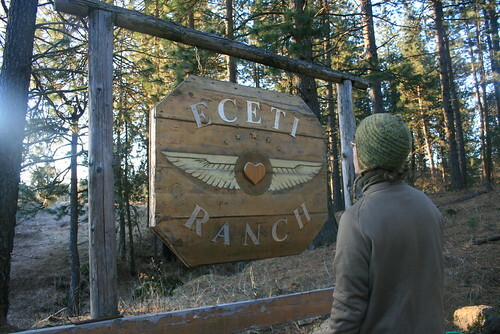 We pulled into ECETI ranch about an hour before sunset. Sebastian and Romy went into the ranch house to announce our arrival, but we kept the car engine on in case the people were really crazy and we needed to make a quick get away or something like that. We were the only ones there, being the middle of February! They get most of their campers and RVs in the summer, of course. 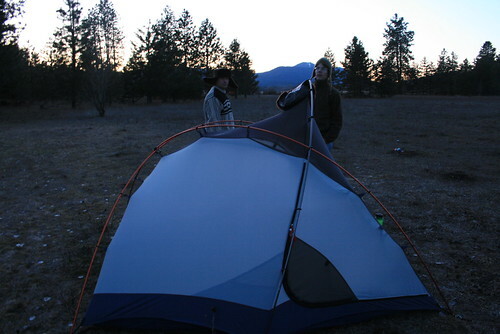 But there we were, setting up the tent in a clearing, with Mt Adam looming over us. The snow on the peak turned brilliant colors of orange, red and purple as the sun set. ECETI Ranch where the aliens might land. 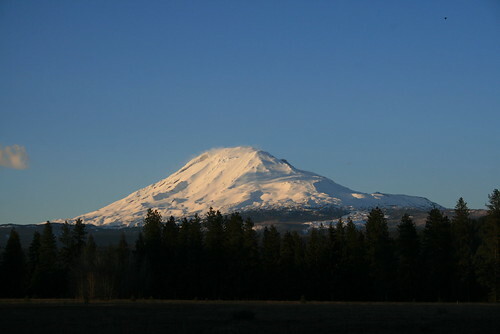 The view of Mt Adams from the ranch. We were notified of ‘the program’ when we finished setting up the tent. They pulled out three lawn chairs for us to sit in out on the field and watch the sky. The dude there, Dan, and one of the women (who I forgot her name) told us about the frequent ships which were flying overhead, and said that we would see most of the activity around 10pm. They said that most of the stuff wasn’t possible to see with the naked eye, so they brought out a pair of night vision goggles for us to look through when it got dark. The temperature was dropping, so we all got out the army sleeping bags and bundled up inside them as we sat in the chairs. The people at the ranch stayed out there with us for a while telling us about the ships they’d seen, and how they believe that the aliens are watching over us. They also said that they’ve seen them flying into the side of Mt Adams in the summertime, and they believe there is a ‘door’ in the mountain where the aliens fly their ships into. The woman believed that there was a tunnel system from Mt Adams all the way south to Shasta. Good thing it was already dark because I could not hold back my smile, and I tried really hard not to laugh out loud at such an absurd statement/idea! As we watched the skies, we were seeing a lot of satellites, although the people at the ranch kept getting excited because they believed they were alien ships flying high. The woman said she loved it when they would ‘power-up’ which she described as an increase in brightness of the ship. Its funny how just the summer before in an astronomy program at Bad Lands National Park, I listened to the ranger and amateur astronomer give a talk about orbiting satellites and why we can even see them in the night skies. Most of them reflect sunlight, which is coming from the other side of the earth at night, just like the moon. Depending on what direction their orbit path is relative to the sun, they can be lit up the entire way across the sky, or only partially. Sometimes they can weakly reflect sunlight until they reach a certain angle in the sky and then brightly reflect the light for a certain arc across the sky. The woman at the ranch was so convinced that satellites could only stay at one level of brightness (she probably thought they had their own source of light, like a star, instead of just reflecting it) that she was sure it was an alien ship powering up. Getting ready to watch the skies for alien ships. 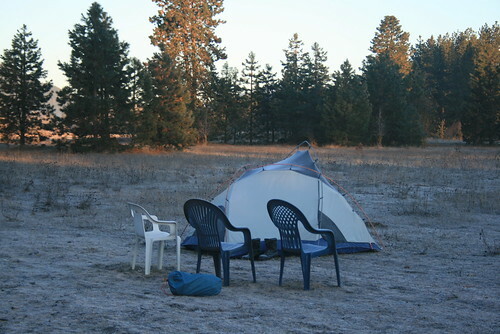 We sat on these chairs all evening watching for UFOs. However, they also described some things that could not be explained by anything rational. And I don’t doubt they’ve seen a bunch of things in the sky - they probably did. We kept watching the sky until about 10:30pm. We saw a bunch of small shooting stars, and then one streak of light which seemed to zig-zag, but it was so fast. I don’t know what that was. We didn’t make alien contact, but we did have a beautiful relaxing (although chilly) night star gazing. It was getting really cold, so they offered for us to stay in the heated guest room instead of camping out in the field at no charge. I really appreciated that. The weather prediction said it was supposed to be in the 40s overnight, but when I got up to go to bed, the breath that condensed around the head part of my sleeping bag was frozen. The moisture in the air froze on our sleeping bags and we were all sparkling in the moonlight because of the thin layer of ice crystals. It was way cool! We looked like aliens, all bundled up in camo and sparkling in the moonlight! 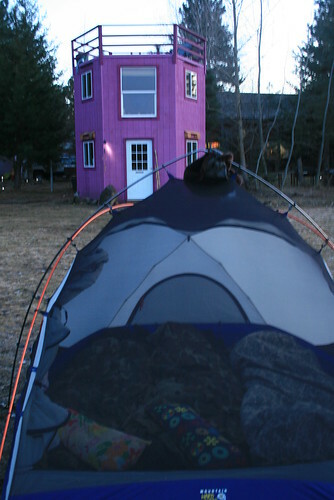 The purple viewing tower at ECETI Ranch. 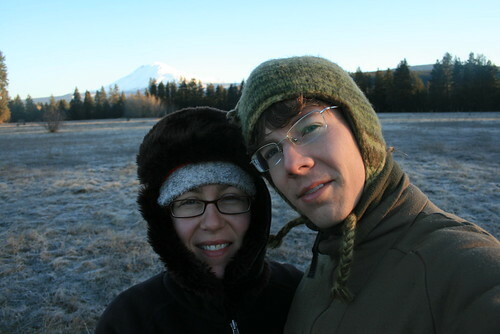 The next morning, me and Romy in front of Mt Adams on ECETI Ranch. 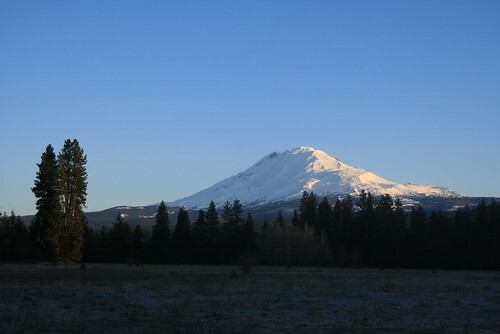 The morning sun on Mt Adams. The next morning, we woke up, and checked on Sebastian, who stayed out in the tent the whole night because he was determined to see some aliens. When we went to go see if he was awake (to check if he was still alive or frozen into a brick) we found the tent coated in ice. He was still sleeping, so we took a walk around the ranch. They had a large yurt and two tipis. I couldn’t resist checking them out and took a lot of pictures. The tipis especially were so beautiful! Now I also want a tipi! 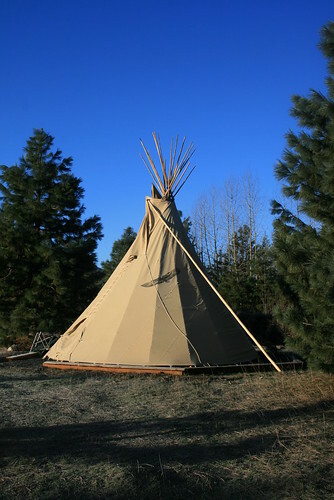 A tipi at ECETI Ranch. 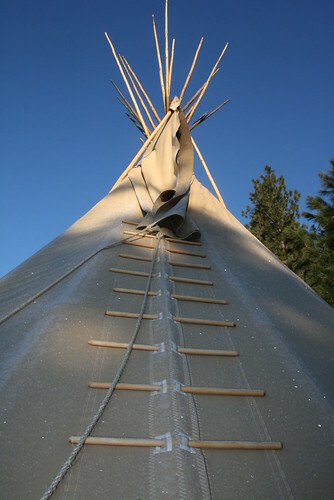 Frost sparkles on the tipi at ECETI Ranch. At 8am we finally decided to wake up Sebastian, and we quickly packed the tent up and warmed up the car. We were ready to make our way back south into Oregon and decided to take a trip to Bagby Hot Springs, in northern Oregon Cascade Mountains. Bagby is a popular natural hot spring where there are two bath houses built that house large cedar logs which were carved out hollow and made into natural hot tubs. The drive down into the mountains was very scenic, and the road followed a couple different rivers. We got to the parking lot at Bagby to find there were already quite a few people there, but of course, it was Sunday and the weather was great. Not even the 1.5 mile hike to the bath houses deters that many people from going, I guess! 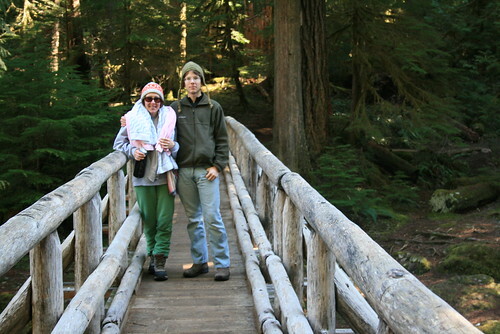 Romy and Sebastian walking to Bagby Hot Springs. Towels all ready for the hot springs! 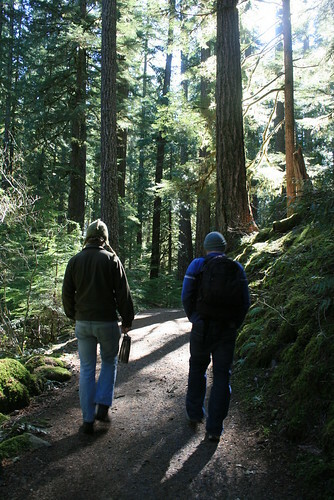 We walked along the trail to the springs, which followed a crystal clear river and wound through a dense forest. It didn't take anytime at all, because we walked quickly being really excited to finally get a chance to visit Bagby. Sebastian never went to a natural hot spring in his life, so he was excited to see what it was all about. The trail crossed over a couple of wooden bridges, and soon we saw the bath houses in the distance. When we got there, all of the private tubs were full, and it looked like the communal deck was full too. There were some people waiting in line, so we also decided to wait. We came all that way, so we were pretty determined to get in! After about 45 minutes of waiting and getting pretty chilly, the first tub on the left opened up! The tub we got was also the first to tap the hot spring, which was so hot that you needed to get cold buckets of water from a cold spring and mix it into the hot water that was tapped from the nearby hot spring. It was fed into the wooden bath house by a wooden aqueduct thing (you can see pictures on the Bagby website). The tub was HUGE! And it was carved out of a giant cedar log hollowed out. We all got in a started the hot water flowing. Then we relaxed and enjoyed the hot water and watched the steam rise up into the forest canopy above. Sebastian and Romy sitting in the hot water. Romy soaking in the cedar tub at Bagby. There were other large round tubs made like barrels, but a group of drunk fat people came and monopolized them. They were so rude and inconsiderate! They were very loud and annoyed everybody. But we had a nice time in the tub we got, and after about 45 minutes we drained the pool and let the next group come in. There were even more people waiting in line, as as we hiked back, more and more people were coming. Its crazy how popular it is on the weekends! I would not recommend going on a weekend. After Bagby, we drove to I-5 and continued driving south until we got near the California border. Then we headed towards the coast, although it was already night time and dark outside. We were looking for a campground in Redwoods National Park, but the ones we drove past were closed, so we ended up sleeping in the car on the side of the road. It was really funny how squished all of us were, but we didn't care, and actually had fun making jokes that we shouldn't get too comfortable because in 10 minutes a cop or ranger would come by and tell us to get the f* out! Hahaha! No cop ever came, even though we were really visible. Oh well, we had a so-so night sleeping, but at least it was peaceful. My cell phone alarm woke us up at 7:30am, and we promptly hit the road to check out the redwoods and the Avenue of the Giants. We decided to go see the Giant Tree in the Rockefeller Forest in Humboldt Redwoods State Park, but in order to see it, you had to cross the river. The seasonal bridges were taken down, since it was the middle of February, so we found a log and crossed it. I was wearing large rubber clunky snow boots, so it was pretty slippery, and I ended up crawling half way down the log across the river! 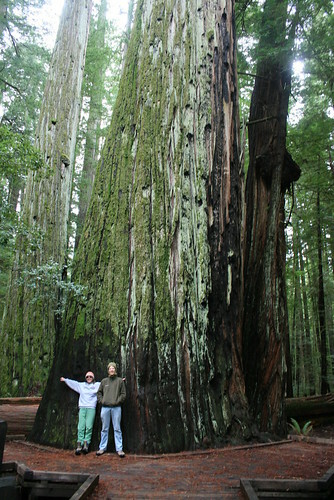 The Giant Tree at Humboldt Redwoods State Park. Me all scared to cross the river on a log, so I crawled half way. Sebastian is probably laughing at me! Haha! I look funny. After that we drove back home, and made it to Oakland around 3pm on Monday. In the two and a half days we were gone, we saw so many things! After we got home today, we had a lot of laundry to do, and now Sebastian and Romy are working on the STI's brakes, so that Sebastian could continue his big road trip safely. I think he'll be heading to Yosemite or Sequoia National Park next, and also Mt Rushmore on his way home.